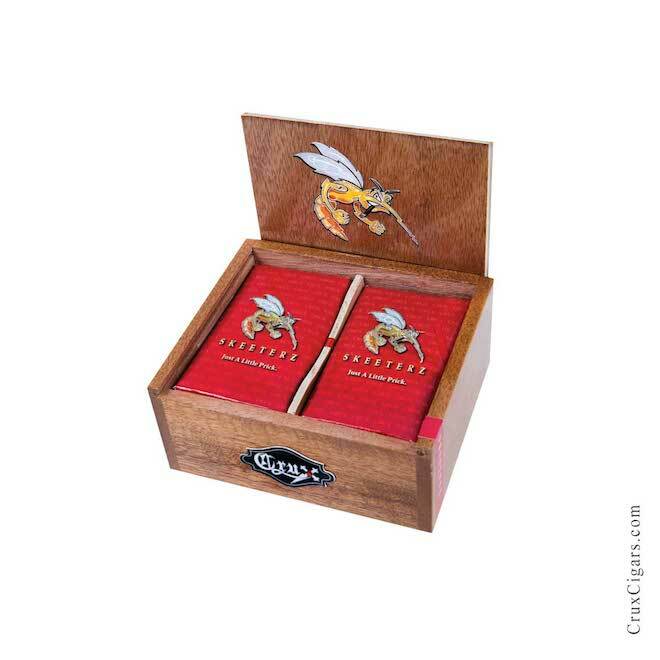 Crux Cigars’ Skeeterz is the third cigar in their debut series. Honestly, I can’t believe I was able to get all three of these done in time. Hooray for me! TWO VIXENS AND A LITTLE PRICK WANT TO MAKE YOUR ACQUAINTANCE. April 4, 2014 (Maple Grove, MN) — More than two decades of successfully selling cigars at retail teaches a person a few things. Hype doesn’t sell. A bad smoke fails immediately (as it should). Excellent quality wins friends who tell more friends. A community grows. Life is good. Meet Jeff Haugen and Joel Rogers, co-owners of Crux Cigar Company, who have expanded beyond retail to production. In April 2014, Crux Cigar Company is releasing three different blends in two different vitolas after more than three years in development. Three more blends follow in May. Get friendly with Ninfamaniac, Ninfamaniac Dark and the Skeeterz. Say good-bye to boring. 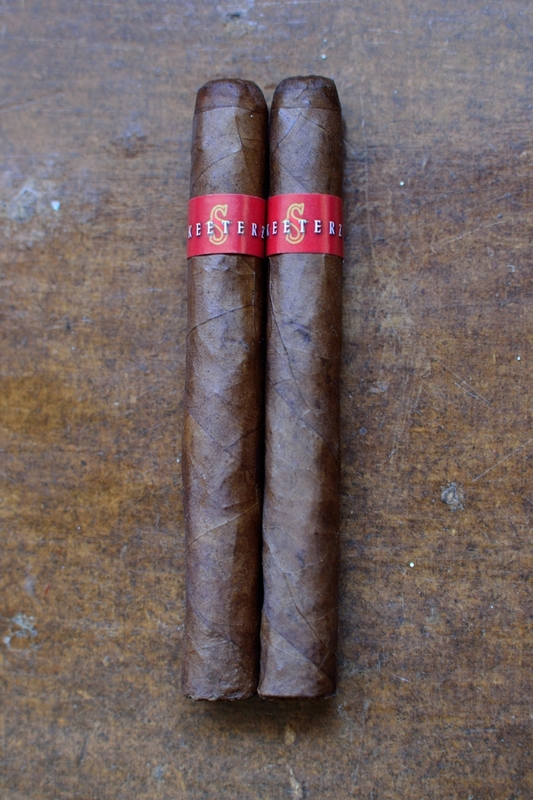 The new best friends are hand-crafted at the Plasencia S.A. factory in Esteli, Nicaragua. Crux Ninfamaniac — 7 x 33 ninfa double perfecto with closed ends. Habano Jalapa wrapper, Indonesian binder and Viso Esteli filler tobaccos. Crux Ninfamaniac Dark — 7 x 33 ninfa double perfecto with closed ends. Jalapa sun grown wrapper, Indonesian binder and Viso Esteli filler tobaccos. • First release production: 5,000 Ninfamanic Natural and 2,000 Ninfamanic Dark. Crux Skeeterz — 4 x 32 purito. Habano wrapper from Nicaragua, Indonesian binder and Nicaraguan habano filler tobaccos. Prelight: Sticking with a bit of a non-traditional size once again, the boys over at Crux Cigars chose a tiny purito vitola for the Skeeterz. I love 4 inch cigars as I tend to smoke on my short 30 minute commute home so this size isn’t necessarily new ground for me. The wrapper on the Skeeterz is really toothy and a medium brown with orange and darker splotches throughout. 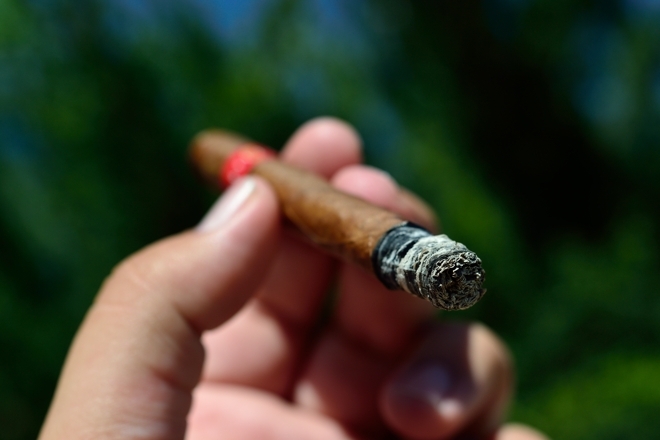 There is a few what looks to be larger veins (not really larger, they are normal size but the small stature of the cigar make them look huge) and some nice webbing in the leaf. The short, slender body is capped off with a nice round double cap. The Skeeterz appearance in a word is rustic polished off with a simple red band with the word “Skeeterz” in white with a light yellow “S” behind it. 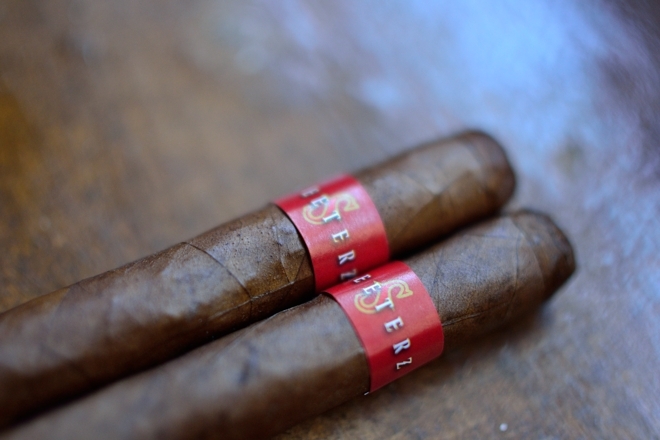 The wrapper on the cigar gives off some sweet spice and coffee while the foot of the cigar gave off a really natural, grassy aroma. The cap cut very clean and very easily using my Palio double bladed cutter. The cold draw produces a grassy, dirt type flavor with bits of spice mixed in. First Half: (Due to the short size of this cigar I am going to split it up into halves vs. my normal thirds). Lighting up the Skeeterz took almost no effort from my single flame torch lighter. 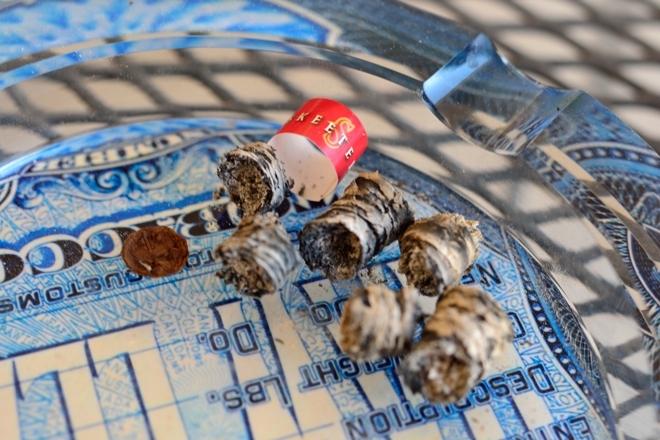 The Skeeterz started out with a nice black pepper flavor which quickly transcended into a strong spice with hints of grass, dirt, tobacco and cocoa. The draw on the Skeeterz is so awesome. Every little puff kicks out mouthful after mouthful of thick, white smoke. The burnline is razor sharp, and dead even. The ash left behind is pretty compact and medium gray in color. 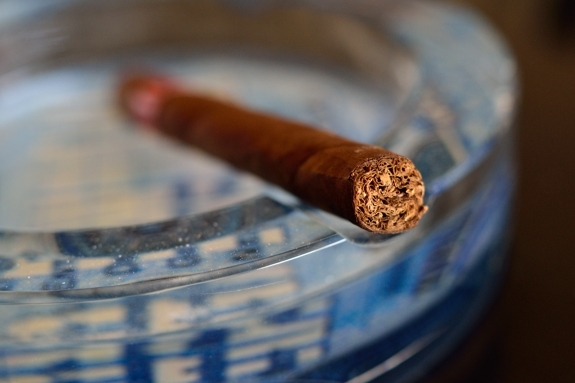 Like the Ninfamaniac, you need to be weary of the ash on this cigar. It’s not very dense so it tends to fall off when you least expect it. It lasted about a half inch in my case before falling into my ashtray. Second Half: Halfway through the Skeeterz and much of the flavor profile has remained the same. A slight bit of black pepper, just enough to tease my lips, lots of spice, dirty, and grass mixed with cocoa and even some caramel that slipped its way through. The retrohale is coated with sharp spice and pepper. A bit too rough to do often. The draw on this cigar is so perfect, pumping out tons of smoke. The burnline was perfect the whole time and never needed any extra attention from my lighter. All in all it took me only about 45 minutes to smoke this down to the nub. 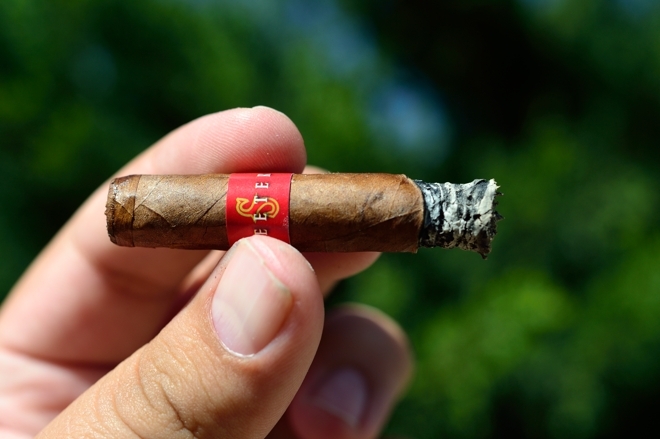 Remember, this is a very small ring gauge so smoking this cigar too fast can easily cause heat or harshness to build up if you are not careful. Luckily for me, the finished was creamy and smooth all the way down to the nub. I felt absolutely nothing in the nicotine department. 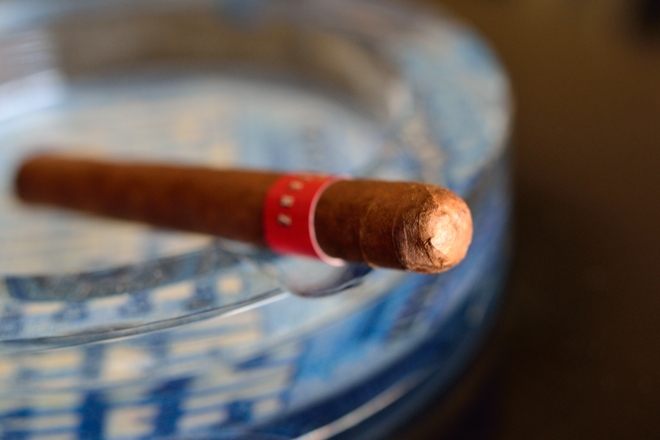 Overview: This is another great cigar from the guys over at Crux. While I don’t think it’s as flavorful or complex as the Ninfamaniac series, at $2.99 a stick it’s pretty hard to turn down. Plus, it serves a different purpose by being such a quick smoke. I could totally see myself buying a big batch of these and enjoying them while driving home, taking a quick break, or just about any other event where a short, flavorful smoke is required. 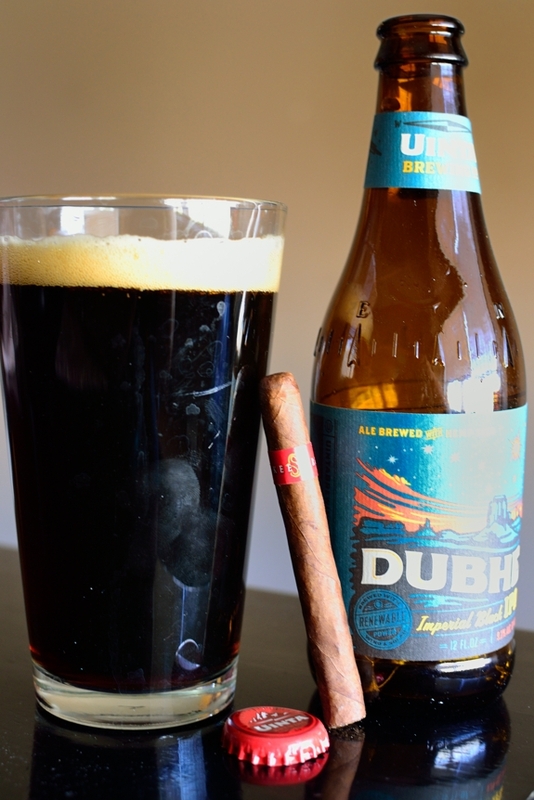 Pairing: Uinta Brewing Company’s Dubhe is a beer full of all sorts of awesome. First of all, it’s a black IPA. We don’t see much of that. Secondly, it’s a black Imperial IPA meaning it’s rocking a ABV of 9.2%. Thirdly, it’s brewed by Uinta. I haven’t had a beer from them I haven’t enjoyed. Dubhe is actually brewed with hemp. In case you haven’t had a beer brewed with hemp it basically adds this extra layer of natural, herbal/dirt flavor for the mixture. I thought of this almost instantly when I lit up my first Skeeterz and I knew that it would pair wonderfully with it, and it did. Dubhe also carries a whole ton of malty notes over some sharp grapefruit and citrus with a hoppy finish. The citrus and grapefruit really added to the cigar while the maltiness balanced it all out.